It's been a quiet couple of weeks around here. Summer is starting so we must get out and enjoy it. Also there really hasn't been much going on with the market. It's been pretty calm up until the last few days.That's evidenced by a a VIX which hasn't seen a closing above 18 since March 10. 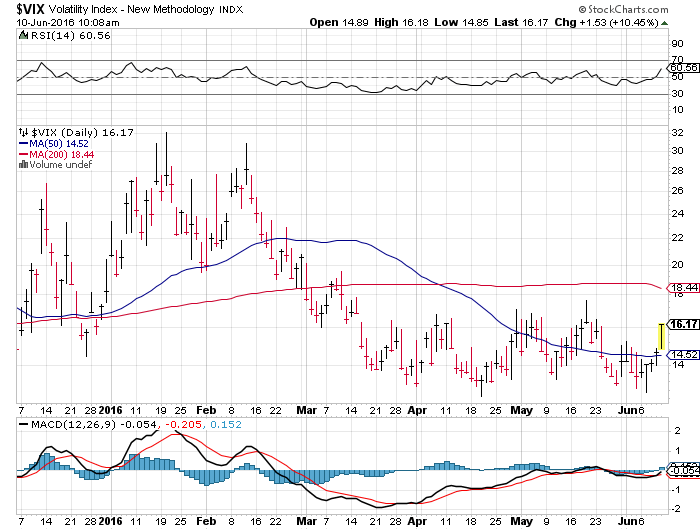 Even with the 1% plummet Friday(as of writing) the VIX didn't even break above 16.50. That's pretty tame. I don't however expect this to last. We have BREXIT coming up which is sure to induce some stomach churning volatility across the globe. BREXIT will be far more important than a FED rate hike. So hang on tight as the ramifications will be felt before and after as big money re-positions itself for the future. On top of that we still have potential rate hikes from the FOMC. The market doesn't expect much from the FED the next two meetings. Especially June with odds around 2%. I disagree with that assumption. I think the market is underestimating the possibility here. Mario Draghi just made a plea with other central banks and the EU to get going. Also the FED doesn't want to wait to close to the elections out of fear it will look political. That's my opinion at least. Back to the EU. The ECB will now begin to actually buy corporate bonds so we shall see what affect this has. Also Draghi basically pleaded with governments across the EU to get on fiscal reform now. He has in the past mentioned this area, but after pulling out all the stops and not seeing the progress expected it's becoming now or never. Without some help from fiscal reform it's becoming more apparent the ECB's cannon is coming up way short. Despite the low volatility there has been quite a bit of action going on within the market. So far this year Energy, Materials, and Industrials have been seeing strong gains compared to other sectors. Utilities still are doing well, but that could be attributed to the continued search for yield, and the amazing amount of volatility and flight to safety we saw at the beginning of the year. Either way Energy, Materials, and Industrials had lagged the market in the past few years. It seems these cyclical sectors are finally starting to turn. That might be a harbinger of things to come. With the economy still showing growth we might be at the point where we can avoid a recession(albeit barely), and continue to see GDP gains. We'll find out in late July with Q2 GDP exactly how the economy is faring. Also government debt has really been gobbled up across the globe. Yields in Germany, Switzerland, UK, and the USA are all near recent or all time lows. It's not surprising considering the how low central banks have kept rates, but investors have been willing to bid the debt to the point where yields are near 0% in a few instances. Switzerland for example is going to auction off 13 year 0% coupon bonds! Ironically investing in long term US Treasuries would have netted you nearly 10%(via TLT) this year. Even junk bonds(JNK) are joining the party again with a 5%+ gain this year so far. Not to shabby at all. It just goes to show investors across the globe are willing to go anywhere to secure their capital. That might be all fine and dandy in the short term. But I'm not sure if the out performance of bonds will continue. With the S&P 500 yielding around 2.1% and 10 year Treasuries at 1.62%, it's hard to believe someone would give up the upside of stocks and a yield that is likely to continue increasing. I did actually have a limit order hit for shares of DEO Friday. I think the volatility will allow me another chance to get shares at a decent price. This is one of the few alcohol companies I'm seeing value in right now and I want to continue building the position. If I'm lucky maybe shares of BUD will fall below $115. The companies merger with SAB Miller is pretty much approved so we that will finally be behind us. Both companies are trading at a better value the peers such as Constellation Brands and Brown Forman. Both of which I'd like to have if they were at better prices. It will be exciting to see how the portfolio performed during Q2. Recent adds with Praxair, and IBB are looking like smart moves. IBB had a real good run, but has come back to earth quite a bit this week. I'm still on the lookout to add to other positions. I really regret switching my limit order I had set for MO a few weeks back. The stock has since gone from $59 straight to $66. That was a 10% gain we missed out on. Just life. That's about all for now. I'm happy with not a lot of portfolio news. It means our stocks are busy working hard day in and day out for us. Have a great weekend all!